Imagine, you live in the most biodiverse place on Earth but have never stepped into real rainforest. You have a beautiful blue-headed macaw as a pet, who you look after tenderly, talk to every day and love dearly. But you have no idea that it’s threatened with extinction and have never been taught about the importance of protecting rainforest animals in the wild. For you, the only value the rainforest has is when it’s cut down to plant banana crops, as this is the only way your parents can feed you, your brothers and sisters. You will grow up to be a farmer and carry on your family’s tradition of cutting down the rainforest. If you’re ambitious you will become a miner or logger because there’s money to be made and you’re tired of being poor – constantly worried about how you will provide for your family, just as your parents worried before you. Or you’ll move to the city in search of jobs and greater opportunities. This is reality for the children that we work with in the Peruvian Amazon. Engaging and empowering the youth is the call of the 2017 UN World Wildlife Day and that’s a huge part of our mission here in the Manu Biosphere Reserve. Living sustainably in the remote Amazon must not only be achievable but also desirable. It must become the best way of meeting a community’s social and economic needs. Only then can we save the rainforest for the benefit of future generations. This journey begins with environmental education. In 2016, we provided education days and classes for 109 local children from 8 to 18 years old. It may seem strange that children who live in the Amazon and especially here in the Manu Biosphere Reserve, one of the most biodiverse places on Earth, are not familiar with their local wildlife or fully understand the importance of protecting their environment. 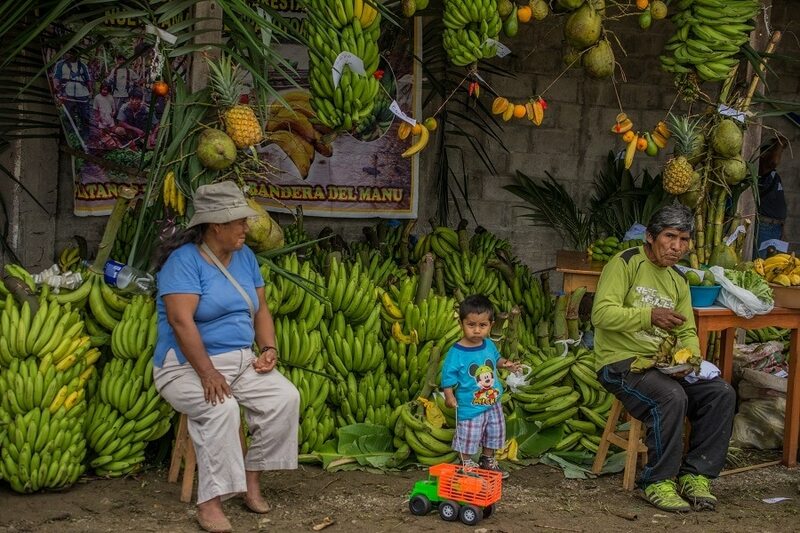 The community that we work with are from the high Andes and settled in the Amazon in 50s and 60s when there were government incentives to buy cheap land. They do not have traditional knowledge of how to manage land within a tropical forest ecosystem. This has caused the community much suffering. As part of our education programme, we host schoolchildren at our nature reserve so that they can learn about the different values that the rainforest can have – such as through ecotourism, conservation research and sustainable agriculture. 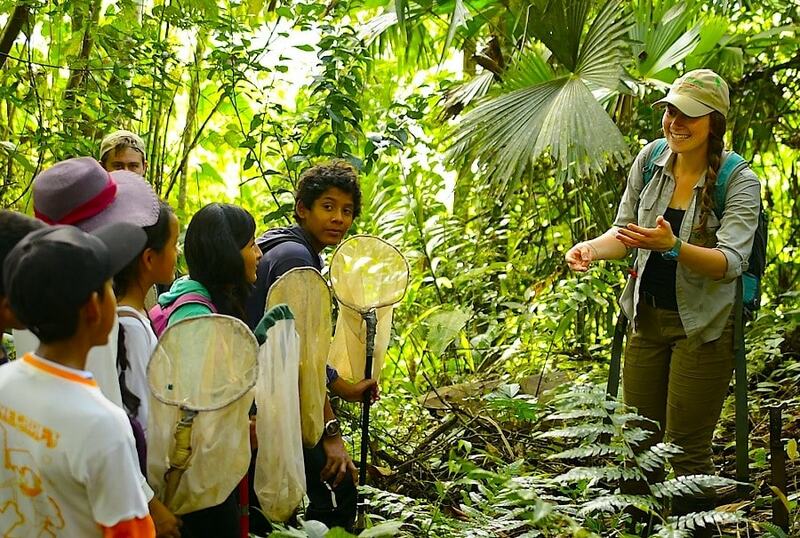 Through these Rainforest Experience Days, children get actively involved in conservation research, cultural exchanges with our visitors, and experience up-close wildlife encounters. We want them to feel a sense of pride because they live in a place that’s of global importance, while learning how they can play a critical role in its protection. We are looking to inspire the next generation so that they become ambassadors for conservation within their community. To do this, we need to make sustainability a real choice. The long term aim of our experiential learning programme – both for local children and international visitors – is to encourage independent, critical thinkers who can make informed decisions based on greater environmental knowledge and appreciation. Only then will we save the Amazon.